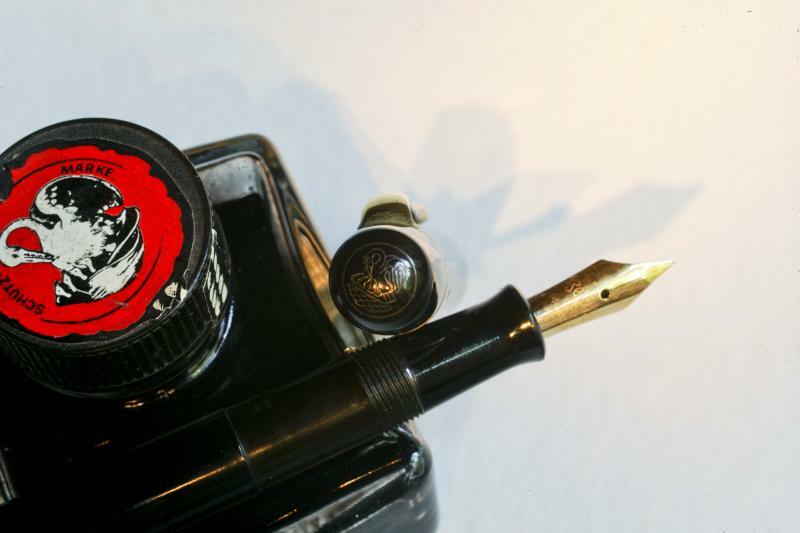 Recently I acquired a 100 Pelikan, which was offered to me as an authentic Danzig Pelikan. When I cited to my source the common understandings about Danzig Pelikans ...... i.e. *Danzig production started in the latter part of the 30's. When I presented these views, my source told me that the so-called experts here did not have access to this documentation. Also my source insisted it was common knowledge, that Danzig (Gdańsk )produced both 100 and 100N's, and was functioning all through the 30's and through the war. He pointed out that the 100 Danzig I purchased was an "early one", The four chick cap logo identified that. This pen (IMHO), provokes questions, and perhaps opens some understanding. The Danzig,(Gdańsk) factory, opened in the latter part of the 30's. The Danzig,(Gdańsk) factory only produced Pelikan 100N's. That they did not produce Pelikan 100's. All Danzig,(Gdańsk) pens are identified by a single cap band, and by the distinctive shaped so-called "Danzig" clip. I offer here photos of a Pelikan 100 Danzig, which I believe to be authentic. It has a two band cap, and the Danzig style clip. (At first, I thought it maybe was a 100N cap ....... no ..... the cap is the correct smaller size of the 100. It will not screw on to a 100N, (I tired), it is too small. Next I thought, perhaps a Danzig style clip was machined down to fit a smaller 100 cap. .... ? Not likely, ... the clip circumfrence would have to be milled around, to have it flush with the smaller 100 cap. Too much work, and it could be readily seen. No sign of clip reworking. this Pelikan 100 has the early, 4 chick cap imprint. This is counter to the assertion that the factory opened in the latter part of the 30's. In support of that, I offer ** advertisements produced by the Danzig factory, or rather, perhaps, produced elsewhere, but bearing the Danzig name. Those advertisements show Pelikan 100 pens that have two band caps. **(I thought I could include those advertisements here, but somehow I am limited in my posting of attachments. 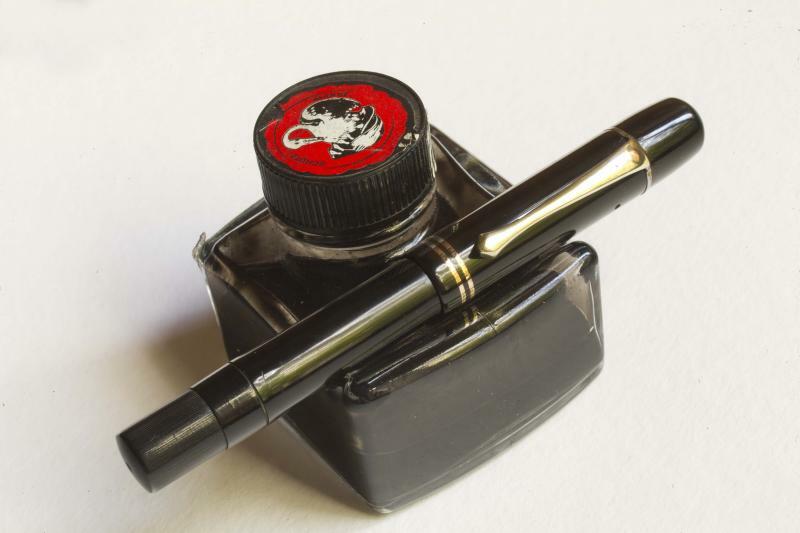 To see the advertisements, see the thread I started in the Pelikan Forum called, "Anyone Heard of a Danzig 100?" Edited by Rafael Macia, 31 July 2013 - 18:49. "Beautiful is that which happens without interest"
I am limited in my posting of attachments. Please see my other thread "Anyone Heard of a 100 Danzig?" in the Pelikan forum which shows the advertisements I mentioned. Edited by Rafael Macia, 31 July 2013 - 18:04. I'm going to post here rather than in the other thread, because this one has the photos. The issue of provenance of pens is one that's been bounced around for some time. Consumer product manufacturing doesn't lend itself to the same sorts of discussions as paintings, sculptures, or rare musical instruments. One often doesn't have a document set that conclusively "proves" the chain-of-evidence from the factory through to the modern day, as even sales receipts from stores scores of years past often disappear, let alone the subsequent secondary sales/inheritances/gifts through to today. It's even more complicated by end-sellers such as shops making alterations (e.g., nib changes) that could alter the net-end-user product. There are several mechanisms that help the pen collector assess issues such as this, including industrial announcements, bulk order information, sales announcements, and advertisements. While it's true that each of these can issued erroneously or boastfully (what the software people have called "vapourware"), an assembly of data can show a reasonable path to verification. Coupled with that, multiple copies of the item provide a certain amount of verification, at least in the Pelikan world, as there has been little incentive for counterfeiting of pens in the main. Several examples in Pelikans over the last ten years or so include the M250 Tortoise marketed through Levenger and Office Depot, and the rather rare M600 and M800 Tortoise pens that went through Spanish and Japanese channels. All of these were considered possible "Frankenpens" for a period, but over time, the reasonability of these as "authentic" Pelikans became generally accepted within the fountain pen community, noting for the record, that there's not exactly a single "certifying authority" on these topics. It's also important to note that there have been what are called "lunchtime specials". If a pen is made in the Pelikan factory in small numbers, even one, is it any less a Pelikan ? Tough question, but there were red and yellow Pelikan Toledos circulating prior to general release. Are those any less "authentic"? What about other prototypes that find their way out of the factory ? At what point is a Pelikan from the Pelikan facility no longer a "true Pelikan" ? This latest "new" Danzig Pelikan is a lovely specimen. It's hard to say if we'll find a larger amount of information on the manufacture, given the number of years, as well as the various political turmoils that have occurred since the nominal date of manufacture, but the initially provided information is rather fascinating. In this case, we have an industrial announcement as well as some advertising, and an additional specimen. This all sounds pretty solid, if not perhaps completely definitive. I think that this an exciting finding and look forward to more data ! Thanks to John (above) for his comments and clarifications. I hope that Rafael will not take offense if I disclose here that he and I have e-mailed back and forth on this question and that I remain skeptical of these claims for the Danzig facility. The evidence thus far presented is not convincing to me as the leaflets show standard cuts and plates that Pelikan used for illustration and advertisement. Far more definitive would be catalogues, which we do not have, showing exactly what was produced in Gdansk and when. Lacking that, the journalistic account cited on the other thread might prove to be a sort of missing link and I have asked to get a high resolution copy to have translated by an independent Polish scholar of my acquaintance. The account might go far to substantiate these claims, but as of now I think we just do not have enough data to state that pens such as those depicted above came out of the Danzig facility. I think that it's entirely fair to test the data available on this case. While the pen collecting business isn't quite on the scholarly level of, say, correct attribution of Rembrandt's paintings, there's also a sincere desire to be as accurate as possible. Edited by PJohnP, 01 August 2013 - 18:15. Here is an earlier post http://www.fountainp...tion/?p=2105948 that states that the Danzig facility was primarily used to assemble parts from Germany into pens so as to avoid Polish custom duties. Edited by MarkTrain, 02 August 2013 - 02:17.